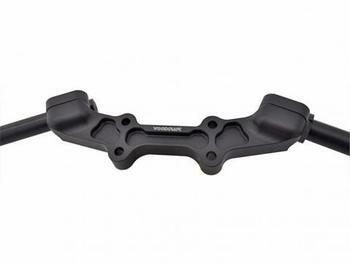 Woodcraft Technologies of Winchendon, Mass., is recalling about 400 Woodcraft clip-on adapters for motorcycle handlebars. The company has received two reports of the adapter plates cracking. No injuries have been reported. This recall involves Woodcraft clip-on on adapter plates. The adapter plates are the center part of the assembly sold to replace your handlebars with a clip-on style set up that can be adjusted for street riding or track use. They can be installed either in an “up” or “down” position, and are compatible with certain Yamaha FZ07 and Ducati Monster motorcycles. They were sold in black and have “Woodcraft” printed in the middle of the plate. The part number can be found on the left end side of the packaging. The adapter plates, manufactured in the U.S., were sold at Woodcraft stores and Woodcraft dealers nationwide from April 2015, through January 2017, for about $260. Consumers may contact Woodcraft toll-free at (888) 442-6996 from 9 a.m. to 5 p.m. (ET) Monday through Friday, by email at info@woodcraft-cfm.com or online at www.woodcraft-cfm.com and click on the adapter plate link for more information.